I discussed in class the relationship between advertising and journalism. Journalism needs advertising in order to stay afloat, but where is the line between the two? Editorial content and advertisements need to be clearly defined as such. Newspapers and magazines have started using their front page (or cover) as a place for advertisements. 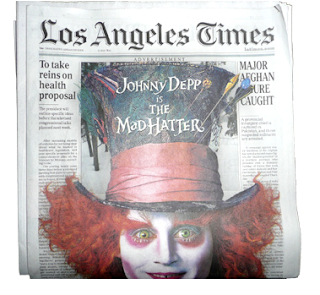 Those pages turn the most profit for advertising, and in a world where studios are paying $700,000 (what it cost Disney to put the Alice in Wonderland ad on the front page of the L.A. Times) it's hard to blame "dying" newspapers for selling out. 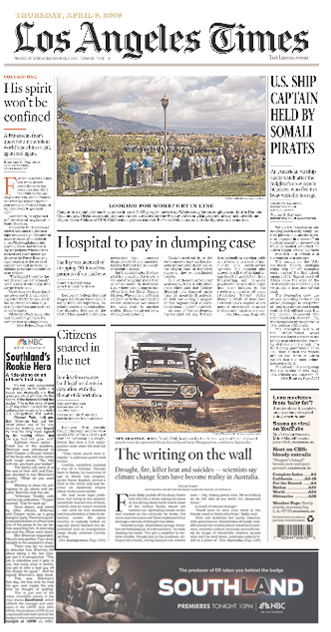 The Times first began printing misleading front page advertisements in 2009, when they put an ad for NBC's 'Southland' on the front page (picture to the right), directly next to the editorial content. While there was a large NBC logo above the ad, and the font was also different, it is easy to see how readers could have been mislead. Time and time again The L.A. Times appears to be more interested in helping their advertising partners than reporting the news. They had a similar unapologetic response to their Law and Order cover, which was arguably much less obviously an advertisement than the Alice in Wonderland one. Another example I mentioned in class was editorial content and advertising in magazines. Open any women's magazine, and you can't tell a fashion spread shot by the magazine from an advertisment shot for Nordstrom. --Distinguishe between advocacy and news reporting. Analysis and commentary should be labeled and not misrepresent fact or context. --Distinguish news from advertising and shun hybrids that blur the lines between the two. --Avoid conflicts of interest, real or perceived. --Deny favored treatment to advertisers and special interests and resist theri pressure to influence news coverage. I think we're letting the L.A. Times off the hook for their advertisements since it's Hollywood. What do you think? An article about retouching pictures in magazines. Is it okay for a magazine that says they won't retouch any of their pictures to print retouched advertisements? Readers' responses to the Law & Order ad. A blog post about product placement in editorial content. Thanks everyone for your questions and insight on my presentation Thursday. In my class presentation I examined the relationship between embedded reporters and the military, as well as the perceived notion that embedded journalists are more prone to produce pro-American coverage as opposed to journalists who are not plugged into a military unit. I feel that the consensus from the class discussion was that war reporting is really important for the American audience; it’s just a matter of how that information is obtained and published, and whether it is trustworthy and follows the U.S. military’s Media Ground Rules. The U.S. military was adamant that these rules were broken by Washington Times reporter Wayne M. Anderson, who was embedded with a Minnesota Air National Guard Unit at Camp Shaneen in Afghanistan this past summer. To recap, a complicated shooting occurred at the NATO facility at Shaneen between U.S. forces and allied Afghan-soldiers-in-training, with two killed and another four wounded. Anderson investigated the incident and ten days later published an account of the shooting in the Times, an article which was supplemented with a video of the wounded being transported to the hospital. The military contended that the video, which was removed from the Times website within 48 hours after it was posted, broke the Media Ground Rules contract in which Anderson signed. One of the major rules, in short, prohibits journalists from showing recognizable faces of soldiers wounded or killed in action. Anderson was expelled from the unit in Afghanistan for posting the video. Would Anderson have been better off working independently, or is it unrealistic to believe he would’ve had an opportunity to catch this story without embedding? After coming to terms with the U.S. military’s Media Ground Rules contract, was Anderson ethically right to shoot video and write his story? Are the government’s Media Ground Rules and releasable and non-releasable contracts reasonable and fair to journalists? Should Anderson have a constitutional right to appeal the military’s ruling? I also posted a few links below that I hope are useful in thinking about this media issue (including the Washington Times article and a copy of the Media Ground Rules). Thanks for your time guys. Photo illustrations can be traced back to the beginning of the creation of photography, but in recent years the trend is starting to discredit many publications. With more and more doctored images popping up in magazines, newspapers and online, the public is starting to look at all photographs with skepticism. while Time darkened and blurred Simpson's face. After receiving harsh criticism about the manipulated cover immediately after it's release, Time pulled the issue and ordered a reprint. Many minority groups said Time altered the cover to show Simpson in a more sinister light and accused the magazine of racism. The illustrator of the image (not the photographer – the image was a mug shot from LAPD), Mar Mahurin, said he wanted to make the cover "more artful, more compelling." his head down on a Louisiana beach. The original image portrayed a scene of the president standing next to a member of the coast guard and a local parish president, Charlotte Randolph. woman would have been puzzling to readers," said Emma Duncan, deputy editor of The Economist. Another cover of The Economist was altered and ran on May 15, 2010. This one eliminated the background of an photo showing President Obama walking. Duncan says the image was edited in order to bring out the central character, which it certainly does. vocate, both are manipulated photos, showing something other than what was truly happening in the images. On the other hand, the "It's time" cover of The Economist is more of an artistic illustration meant to attract attention. Does that make it OK? The question of labeling was a topic of huge debate after Newsweek ran a photo illustration on the cover of their March 3, 2005 publication. The cover showed the body of a model shot in a Los Angeles studio paired with Martha Stewart's head. Originally, the cover shot was credited to Marc Bryan-Brown, who shot the model in the studio. Newsweek corrected the byline in their next edition, and on page 3 of the March 14 issue they called the cover a photo illustration. 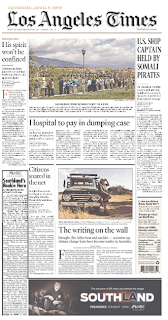 The National Press Photographer's Association called the cover a "major ethical breach." Jack Zibluk, an associate professor of photojournalism at Arkansas State University, brought up the issue of labeling. "I find it very disconcerting that Newsweek's editors see 'labeling' as the answer to the issue. It's not. The real answer to rebuilding the trust of the audience is to commit to true and accurate photojournalism...The tendency to use more illustrations and fewer real photojournalistic images is blurring the line between opinion and truth the same way Web blogs and talk radio are blurring the line between 'honest news' and one-sided screed." If you want to find more manipulated photos, you don't have to dig too deep. Here are some links to a few others I showed in class. This one is huge, guys. There's really too much to write about concisely, and some of the best information has come from reading dramatically varied opinion pieces from all sides of the issue. Some basic questions: is Julian Assange (WikiLeaks' founder and public face) a terrorist for publishing classified information he does not own, or is he a free speech hero? Assange has been editorializing, intentionally 'stirring the pot' for political impact by adding titles to videos, teasing for upcoming releases, dropping huge amounts of data at critical times, and giving multiple global publications advance access to the documents (essentially forcing them to publish). Does this make him a journalist? If the U.S. wanted to try Assange in court (assuming they can catch him), on what grounds could he be prosecuted? The Espionage Act of 1917? (Don't forget, he's Australian). Would 1st Amendment free speech or free press arguments protect him? What about the NYTimes? If a case was brought against WikiLeaks, shouldn't the other papers that published the information be brought to trial as well? What should happen to people like Pfc. Bradley Manning, who has been accused of leaking classified information to the site? Assange himself, hosted on TED.com “Why the world needs WikiLeaks.” July 2010. The Stephen Colbert interview I showed in class. 13 April 2010. Andy Greenberg, writing for Forbes Magazine. Here's the article, and the full interview. An interview with Der Spiegel, the German publication given advance notice of the leaks this summer. Fred Kaplan, writing for Slate.com, has some pretty good insights. Peter Ludlow's piece for the Nation, explaining Assange's behavior in light of hacker ethics. Sarah Palin has some “Serious Questions About Team Obama’s Handling of the WikiLeaks Fiasco,” if anybody's still listening to her. Moe Tkacik is all about government transparency. And here's the "Collateral Murder" video we saw some of in class. Let me know what you think. I'd love to see some serious questions in the comments starting...now. The goal of journalism is to provide diverse and inclusive reporting. But analysts say modern media is failing to serve the majority of the human population: women. 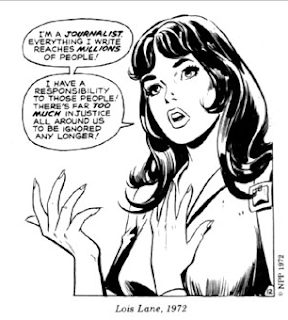 Women are underrepresented in many areas of the journalism profession, and women’s issues are often ignored or portrayed in problematic ways. The 2010 Media Report to Women, compiled by Sheila Gibbons, lays out statistics showing that nearly across the board, women are underrepresented in journalism jobs. The problem is pervasive in traditional print media: About 36 percent of full-time daily newspaper staff are women. About 16 percent of those women are minorities. Sports reporting maintains the most noticeable gender divide. The 2008 “Race and Gender Report Card of the Associated Press Sports Editors" found “sports journalist jobs are overwhelmingly white and male." Women are 9 percent of sports reporters and 6 percent of editors. The divide is not so wide in television broadcast reporting. In “Beyond ‘Anchorman’,” two journalism students collected data on broadcast reporting from a sample week in 2007, then compared the results to a similar study from 1987. The study found that in 2007, men reported 48 percent of stories, women reported 40 percent, and the rest were team effort. This is a substantial improvement over 1987, when men reported 73 percent of stories. The study also found an increase in the number of women and minorities appearing in front of the camera. Besides the apparent lack of women as newswriters, other case studies show how women’s voices are missing on the news itself nearly worldwide. Nov. 9, 2009 was Global Media Monitoring Day. Only 16 percent of stories broadcast or printed that day focused on women’s issues. The project found near equality in the quoting of popular opinion, but when expert opinions are used, 80 percent are men. Some journalists have addressed the portrayal of women’s issues in mainstream media by simply exiting the mainstream media. Women’s eNews was founded in 2000 by Rita Henley Jensen to report on issues not being covered elsewhere. “Newsworthy should be as gender-neutral a term as the word reporter. Sadly, although women have flooded the field of journalism, the folks who decide who and what should be covered are still working out of a testosterone-soaked playbook." Greetings, Ethics &Trends in News Media Section 3. My presentation dealt with Dennis Rader (AKA the BTK Killer) and his personal contact with the media. What follows is an overview, complete with more details on the case. Enjoy! Rader was a native of Wichita, Kansas. He married, started a family, and was a leader in his church and his community, even serving as president of his church congregation at Christ Lutheran (ELCA, in case you were wondering.) While he was doing this, he also committed his known murders from the early 1970s to 1991, starting with four members of the Otero family on January 15, 1974. Here is a link to an overview of Rader's crimes. Throughout his killing career, Rader taunted the police and the media by communicating with them directly. He sent packages to both the police and the media. Rader's first communication occured October of 1974, approximately ten months after the Otero family murders. During the 1970s, the killer sent letters to The Wichita Eagle, KAKE-TV (the ABC affiliate) and KSAS (the Fox affiliate.) His messages contained graphic details regarding the murders. His first message was found in the Wichita Public Library and contained a detailed description of the Otero killings. 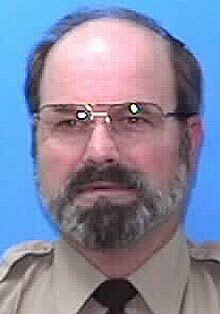 He suggested people refer to him as BTK because he liked to "bind them, torture them, and kill them." BTK used his acronym as a signature to mark his work. Sometimes, Rader addressed reporters personally, as seen when he apologized for two anchors' colds. He often referred to other correspondence when writing to news outlets and spoke in a conversational tone, as seen in the previous link when he asked them to let him know whether they received the package at Home Depot and added "Thanks." For a map of BTK's actions, click here. The media published information on BTK, but didn't necessarily reveal everything disclosed to him by the killer. This was often in compliance with police request. 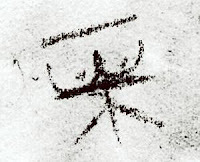 Robert Beattie, who later wrote a book about BTK, said that showed a puzzle from Rader's correspondence and showed it to a local Mensa Club, the members of which pleaded him to ignore police requests to remain silent and share the puzzle with the public in the hopes that someone could discover its meaning. In an interview with Larry King, Hurst Laviana said, "I have regrets for holding things back. . .I wonder now whether we did the right thing, of editing the evidence. Would the police have been able to find a suspect sooner? Did we do the public a disservice?" NEW: However, according to Brian Orloff, Laviana later "told [Editor & Publisher] that he feels comfortable with the Eagle's treatment of the evidence. He says the paper only refused to publish one letter with a BTK signature and a series of numbers and letters, which it published Wednesday." (The link was my addition. Orloff's complete article can be found here.) Laviana said they withheld details such as his signature to help police "weed out the copycats" and make the killer more identifiable. Laviana described the "series of numbers and letters," saying it was "like gibberish. It didn't look like it meant anything. That's what I meant when I told the L.A. Times reporter that maybe that was not the right thing to do. I'm not saying it was the wrong thing to do, I'm not saying it was the right thing to do. But if there's anything to second guess, it would be that decision." Among the items received by KAKE-TV were a puzzle filled with clues and a doll, its hands bound and a bag over its head. The BTK Killer was silent for an extended period and resumed correspondence after the Eagle wrote an article to mark the anniversary of his killings. BTK was eventually caught based on information pulled from this correspondence. In conclusion, I believe the media were not wrong to withhold some information when reporting the BTK killer's actions or sharing information with the police. While the SPJ code says to act independently, it's important to remember that sometimes working with the police can serve the good of the public. We shouldn't withhold information from the police for the sake of withholding information from the police; the same goes for divulging information to the general public. Above all, I would want to try my hardest to catch the creep who murdered people and give him as little attention as possible in the process. And if that's a form of bias, then so be it.